FLORHAM PARK, N.J. (AP) — The New York Jets will spend the next few weeks sorting through their intriguing quarterback situation, with Sam Darnold, Josh McCown and Teddy Bridgewater the clear focus of attention. But the tight ends are in perhaps the most tightly contested competition of camp. New York has a group of five mostly unheralded players trying to win roster spots and be among the guys catching passes from whoever ends up under center this season. Clive Walford and Neal Sterling are the most experienced of the bunch, with both entering their fourth NFL season — but are hardly household names. Eric Tomlinson has established himself as a solid pass-blocking tight end since entering the league in 2015. Jordan Leggett was a fifth-round draft pick last year, but spent most of the season on injured reserve and is again dealing with an undisclosed injury that has sidelined him the last few practices. 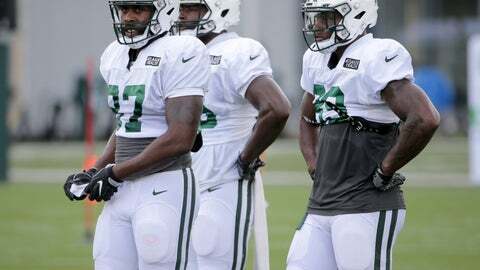 The Jets also drafted Chris Herndon this year in the fourth round, and has an opportunity to win the starting job. New York actually opened camp with six tight ends, but waived Bucky Hodges after just two practices. The tight end position had been mostly an afterthought in the Jets’ offense in recent seasons until Austin Seferian-Jenkins caught a career-high 50 passes to rank third on the team in receptions. But he signed with Jacksonville in March after New York allowed him to leave as a free agent. 6-foot-4, 253 pounds, 22 years old, rookie, Miami. Herndon had four catches in team drills during the Jets’ scrimmage at Rutgers on Saturday night, continuing a strong camp. Herndon had 86 catches for 1,048 yards and seven touchdowns in four seasons with the Hurricanes, and was regarded as a mostly solid blocker. He injured a knee late last season and was limited in spring workouts, but is now healthy. It’s uncertain, however, if he’ll be available at the start of the regular season. Herndon was arrested in May for driving while intoxicated in New Jersey and is facing possible discipline from the NFL. 6-5, 258, 23, second season, Clemson. Leggett might be the biggest wild-card in the bunch because he hasn’t been able to stay healthy, but has displayed solid pass-catching skills when he’s been on the field. Leggett actually entered camp last year expected to be the starter on opening day because Seferian-Jenkins had to serve a two-game suspension for a DUI. But Leggett injured a knee early in the preseason and had his season officially end in October when he was placed on IR. 6-4, 257, 26, fourth season, Monmouth. Sterling has shown good hands this summer after limited action with the Jets last season. He was a seventh-round pick of Jacksonville in 2015 and had no catches in nine games. Sterling caught 12 passes for 110 yards in his second season with the Jaguars, but was waived last September as one of the team’s camp cuts. The Jets signed him and waived him a month later, but then plucked him from Kansas City’s practice squad last October. 6-6, 263, 26, third season, UTEP. Tomlinson came to the Jets in 2016 with a reputation for being a good blocker during stints in camps with Philadelphia and Houston. He played in seven games with New York two years ago, including five starts, but didn’t flash much pass-catching ability until last season when he had eight receptions for 121 yards and his first NFL touchdown. Tomlinson is also a solid special teamer. 6-4, 250, 26, fourth season, Miami. Walford was a third-round pick by Oakland in 2015 and showed promise in the Raiders’ offense while catching three TD passes in each of his first two seasons. A switch in offensive coordinators last season led to a reduced role for Walford, who was third on the depth chart behind Jared Cook and Lee Smith to start the year. Walford had just three catches through the first 12 games, and finished with nine receptions and no TDs after a concussion sidelined him the final three weeks. He was released by Oakland in March, and claimed off waivers by New York.